There are differences between optimists and pessimists, of course, but basically it comes down to this, according to Dr. Michele Reiss: Optimists believe that good things will happen, and that whatever does happen, things will be OK. Pessimists believe that bad things will happen and they will never be able to handle them. She mentions Weather Channel interviews with victims of natural disasters. Some of those interviewed feel lucky and blessed, while others say they are completely devastated. "The reality is a little of both," Michele says, and people can decide whether to focus on what they have lost -- or what they have left. Most of us live somewhere in the middle of those two extremes, she says. She mentions her brother who has a serious illness, but chooses not to dwell on the things he has lost; the things he can no longer do. She calls this "positive coping" and we can all learn lessons from those who embrace this attitude. "Life gets hard, it's inevitable", she adds. We will lose people we love, we will encounter serious illnesses. Michele says we can visit "woe is me!" but we shouldn't live there. And we can make a choice to celebrate what we have right now. 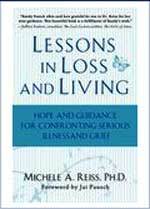 Dr. Michele Reiss is the author of the book, Lessons in Loss and Living. For more information on her, visit this article at http://www.boomthis.com/.